Beautiful Our Lady of the Holy Rosary Church on Esplanade Avenue is one of my favorite churches in New Orleans. I particularly love the gorgeous and unique colors behind the altar, and the spectacular arches. With those beautiful shades of pink, it's one of those churches that is instantly recognizable in a photograph. 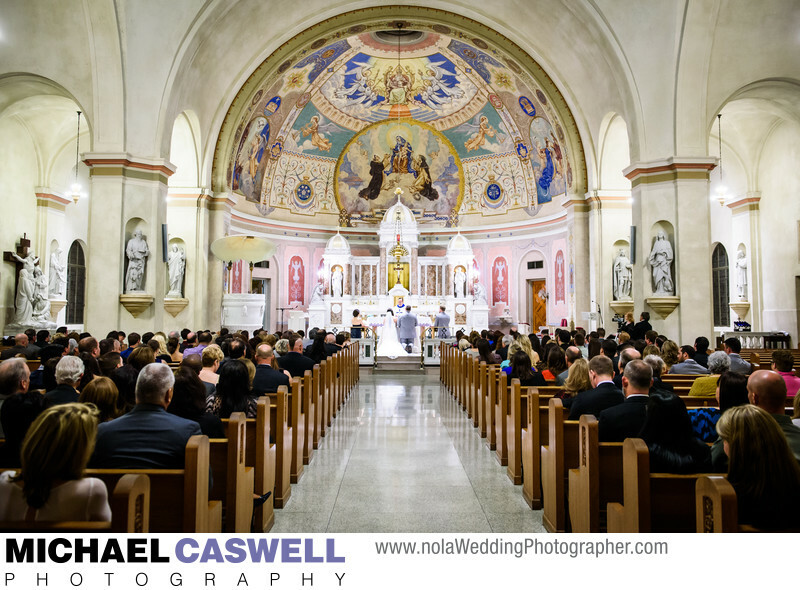 Located near New Orleans City Park, this church is a perfect Catholic wedding ceremony choice for couples with receptions taking place at the Pavilion of Two Sisters or the Arbor Room, as these popular event venues in City Park are just minutes away. Benachi House, The Cannery, and Degas House are also located nearby. Of course, the French Quarter, with its numerous reception venues, is located a relatively short distance away as well. This parish dates back to the early 1900s, with the current church building having been constructed in the mid-1920s. Location: 1322 Moss St, New Orleans, LA 70119.